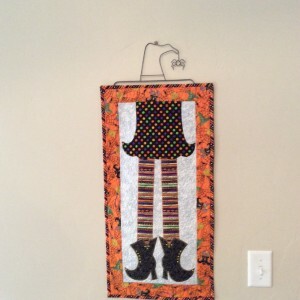 Saw this cute Free Pattern from Moda. I use 1930’s fabrics from my stash and added the light gray dots for border and a pink ‘30’s for binding with a light pink Minky on the back. 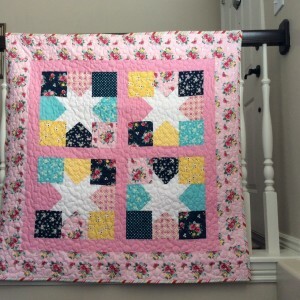 I used a simple all over daisy quilting pattern with a light pink thread. This quilt too is for one of the young Moms at church. This was a fun, quick, and easy quilt pattern. Will have to make more. I’m making wall hangings for my daughter and family for each month. Here is March for St. Patrick’s Day. Best of all it was made from leftovers from another project. I’m getting plenty of practice on drawing. 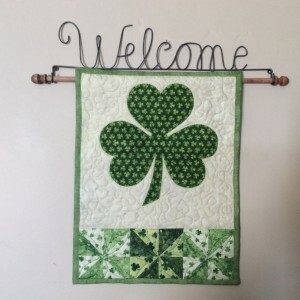 The quilting is simple with heart clovers. You can see on back. This was a fun project. I needed three gifts for some friends, as I had considerable left overs form Sandy Gervais’ Nature’s Christmas, I made 3 Christmas Tree Runners. One with a dark green tree with little berries, one with a holly tree, and one with little pinecones. I used an all over Christmas ornament quilting pattern and a dark red thread. 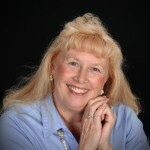 Janet has always been there for my daughter and son in law for babysitting my grandkids kids. She is selfless with her time and will be there whenever needed. I made this quilt for her as a thank you for being a special great grandma. At 83 she still gets down on the floor to play. She is an amazing lady. I used Kaffee Clasics fat quarters and a white Minky for the backing. 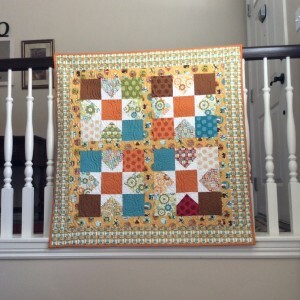 I also used a varigated orange thread for the quilting. 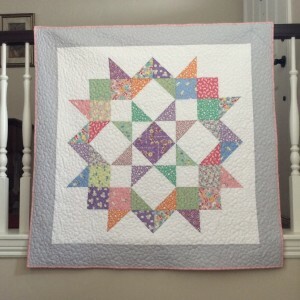 the pattern is Double Square Star from Missouri Star. I made this one for my daughter & family. I was in such a hurry to get it in the mail that I forgot to take pictures first. I used colored thread for the appliqué which was much easier on my eyes. The boots are a black with faint purple stripes running through the fabric. I used purple thread for appliqué nd orange swarski crystals for the accents.. 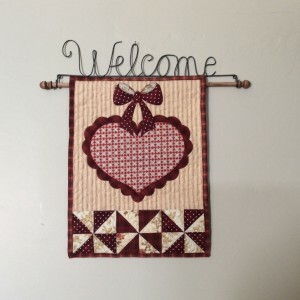 I just love the Happiness Is Handmade fabric line by Lori Whitlock for Riley Blake. I decided to make white stars with the girly colors. I used a pale pink Minky for the backing and made two burp cloths with left over fabric and flannel. 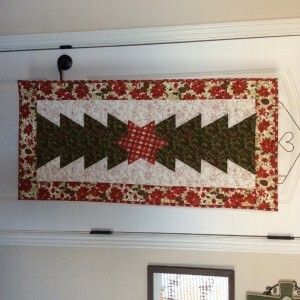 I used a simple daisy pattern for the quilting. For one of the young Moms at church. My cousin and her husband have been career Military. After a recent trip to visit them, I wanted to give thanks for all that they have done for our country (hence the stars) and the awesome hospitality they showed us. The fabric is Castlewood by Moda. I'm sure this fabric is a couple years old. I love the Fall colors and it will go perfectly in their family room. I made two star pillows with zipper back openings to make washing easy. The quilt is backed with with an tan minky. 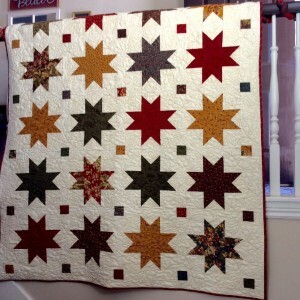 The quilting was done with a matching goldish/tan thread and the pattern really shows on the light background & minky. 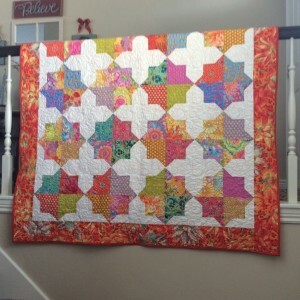 Another left overs quilt. 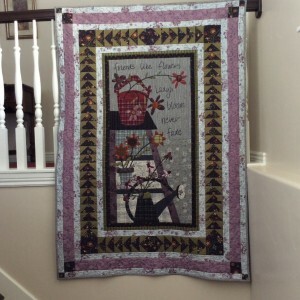 The fabric is Mischief by Nancy Halvorsen for Benertex. Since I had limited fabric left, I made the star legs on the orange centers. I backed it with a blue Minky. I made two burp cloths with leftover flannel & fabric. To finish up the leftovers, I made a traveling diaper changing pad with an attached tie to keep it rolled up for the diaper bag. 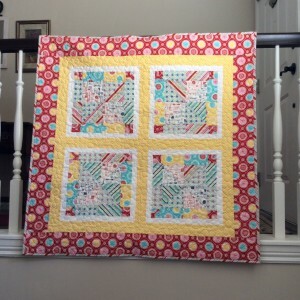 This baby quilt too is for one of the young moms at church. Made for a dear friend that loves celebrating Halloween. 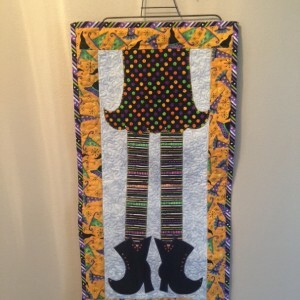 I used fabric from my stash and the pattern is Witches Brew (Seasonal Skinnies) by Ribbon Candy Quilt Company. This is my fourth one and they are all just as much fun.